SoundStage is a fixture of the vibrant Southern California a cappella scene, acclaimed for impressing audiences with their tight, unique jazz-infused sound and providing uplifting impactful entertainment. 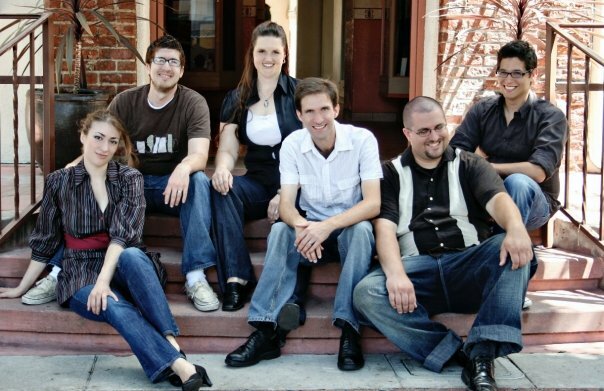 SoundStage has quickly achieved numerous honors, some of which include winning a new car and radio play from jingle competitions, taking top honors at the LA Regional Harmony Sweepstakes (in 2008 and 2010), and enjoying 2nd place and a headlining tour at the 2009 Taiwan International Contemporary A Cappella Festival. -The jingle spots on The Tim Conway Jr. Show including the intro music for The News Bender and the game "What the Hell Did Jesse Jackson Say?" Members past and present: Jammie Hampton, Kim Reed, Brittany Rae, Colleen Keene, Monica Babcock, Apryle Dalmacio, Kristin Morton, Christina Wilson, Holly Hierman, Bradley Hampton, Bryan Malolot, Mossi Watene, Andy Cummins, Kyle Bowen, Ryan Williams, Johnny Figueroa, Todd Honeycutt, Anthony Starble, Joseph Livesey, Brady Bluhm, Tom Keyes, Justin Olvey, Josh Odom. The International Rotary Club International Conference - L.A. Interested in having SoundStage sing for you?